On the heels of a $25 million Series C fundraising round, DigiLens introduces a new waveguide eyeglass display for AR applications-constructed from only two inkjet coated grating layers. It’s thinner, lighter, brighter, and significantly lower in cost. SID Display Week – Los Angeles, CA – May 22, 2018: DigiLens Inc., the Silicon Valley-based company revolutionizing AR displays through innovative waveguide optics and proprietary materials, announced its eagerly anticipated two-layer augmented reality (AR) waveguide display. The DigiLens MonoHUD is now thinner, lighter and can be manufactured at a much faster pace, resulting in a breakthrough in affordability. For smart helmet applications being developed by industry leaders, the MonoHUD provides motorcycle and bike riders with distraction-free content directly in their line of sight, so they can keep their eyes focused on the road ahead. Bike speed, gear change, fuel and oil level status can all be monitored, along with maps, real-time accident warnings, music and other non-distractive smartphone applications–all without looking down at their smartphone. In addition to the new two-layer display that replaces the original three-layer design, DigiLens announced it had begun using a new inkjet coating manufacturing process with significantly increased throughput. Both innovations will lead to more parts from the manufacturing line, higher contrast and significantly less cost. The high efficiency of the DigiLens waveguide allows riders to see crystal-clear terrain, mixed with daylight-bright content ideal for outdoor applications–a gamechanger compared with other conventional display solutions. Young Optics, a leading display manufacturer, is one of the first to license the DigiLens MonoHUD, and will soon be supplying it at high volume. 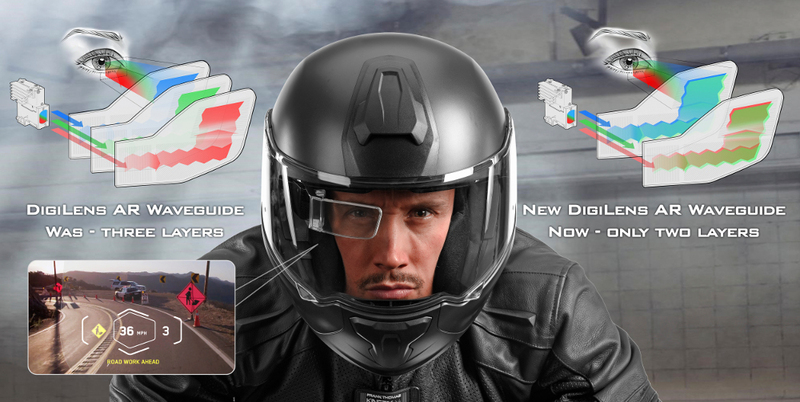 Sena, an industry leader in Bluetooth communications for motorcycle and action sports, is working with Young Optics to integrate the DigiLens display and its communication system into helmets to allow riders to view their phone and dash information through the display. The MonoHUD AR display is full color, nHD image resolution and an unobscured user field-of-view of 105°, and AR display field-of-view of 25° diagonal. It has a maximum brightness of 8,000 nits and up to eight hours of battery life due to outstanding waveguide efficiency. DigiLens’ new two-layer MonoHUD waveguide display technology will be demonstrated at The Society of Information Display’s Display Week in Los Angeles from May 22 – May 24 at the Los Angeles Convention Center, Meeting Room #10. DigiLens’ waveguide optics allow OEMs to access eyeglass-thin displays for wearable AR applications and larger displays for automobiles, avionics, retail and architecture. The company has developed a high-performance photopolymer material and copy process to manufacture precision diffractive optics by printing (not etching) the nanostructures. The resultant eyeglass display has higher efficiency and a wider field of view compared to conventional waveguides. This unique process delivers the key low-cost manufacturing benefit for DigiLens strategic partners, including Panasonic, Sony, Continental, Rockwell Collins and Foxconn. More information about the company’s offerings can be found at www.digilens.com.